Sutro Heights This City park is located in the northwest corner of San Francisco near Ocean Beach. 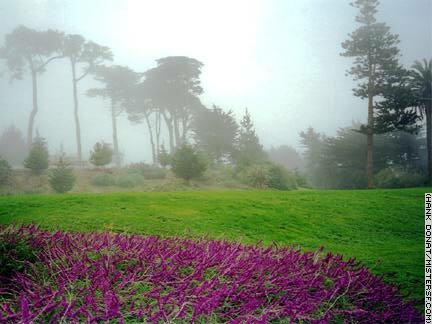 Sutro Heights is "the cliff above the Cliff House." Once the home and grounds of mining baron and former mayor Adolph Sutro, the landscape here includes the mansion ruins and a great copy of a sculpture of Diana the Huntress. The original is at the Louvre in Paris. When the afternoon fog surrounds the Heights, the visitor is treated to something extraordinary. Street noises disappear as the park becomes enveloped, like a pod floating in space, and space is gray and endless. Very lovely.